Parish of Carnock – The Fife Post………..for genealogy and historical information. CARNOCK, a parish, in the district of Dunfermline, county of Fife, 3 miles (W. N. W.) from Dunfermline; containing the village of Cairney-hill, and the hamlet of Gowkhall. This place originally included only the barony of Carnock, and the lands of Blair, and Easter and Wester Camps; but in 1650, the Pitdennies, the lands of Luscar, and those of Clune, which formed part of the parish of Dunfermline, were, by act of the presbytery, annexed to this parish. The church, erected in 1841, is a handsome cruciform structure in the Norman style, with a graceful spire, and contains 400 sittings, with arrangements for the erection of galleries, if requisite, for 200 more; in the churchyard, are considerable remains of the ancient church. There is a place of worship for members of the Free Church; also a meeting-house in connexion with the United Secession Synod. The words cair or cairn and knock signify ‘a cairn or barrows on a hill.’ The whole extent of the parish is about 9 square miles or 2260 square acres. 1665 acres are cultivated and 450 are in woods. Coal is wrought on the estate of Blair in the west of the parish. Freestone is quarried in several place, principally on the estate of Carnock. A considerable number of sheep are grazed in the parish. The cattle commonly reared are the Fife and Teeswater. Wheat, barley, oats, beans, potatoes, turnips, and hay are produced. There are no spinning-mills nor public manufactures in the parish. There is no market-town in the parish. The nearest if Dunfermline. Only one fair is held in the parish, in May, and it is chiefly a cattle and shoe market. There are five inns or alehouses in the parish. Coal is the only fuel used in the parish, and it is procured either at the Blair colliery or from Dunfermline. 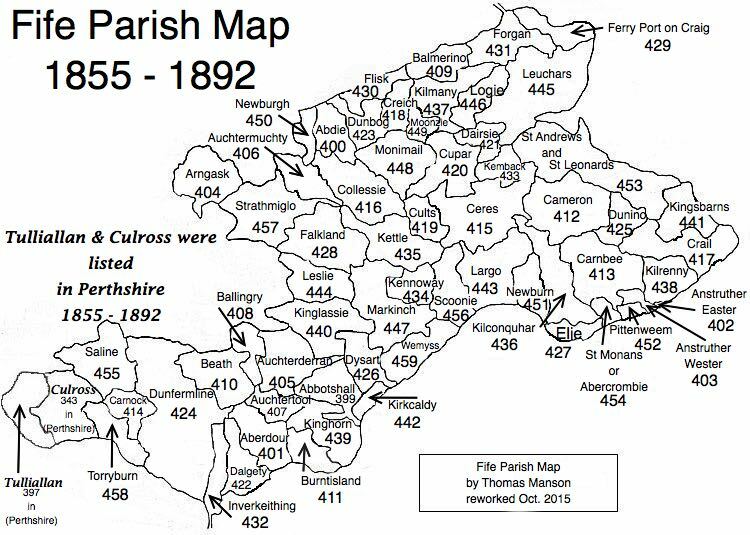 The population of the parish in 1755 was 583, in 1791 was 970, and in 1841 was 1269. The average number of births for the last seven years is 33, of marriages is 10, and of deaths is 21. The number of inhabited houses is 251. The former parish church stood near the village of Carnock. It was built in the 16th century, but it was condemned in 1838. A new church, with seating for 400, was opened in May 1840 a short distance from the old church. The number of persons belonging to the Established Church is 652, in 127 families, but some are in the habit of attending worship in neighbouring parishes. There is one Dissenting meeting-house in the parish, situated in the village of Cairneyhill, and seats 400. The congregation belongs to the United Associate Synod. The number of Dissenters of all denominations is 598. Two are Episcopalians, one a Roman Cathokic, and the remainder adher to the United Secession, the Relief, and the Original Burghers and attend places of worship in Dunfermline. Those not belonging to any denomination number 19. There are two schools in the parish–one the parochial school in Carnock village, and the other, a female school, at Cairneyhill. The number of children in school was 210 in 1834. Of late it has been less, owning to the depression of trade. There are two libraries in the parish, in the two villages. The above extract is from the account written in January 1843.